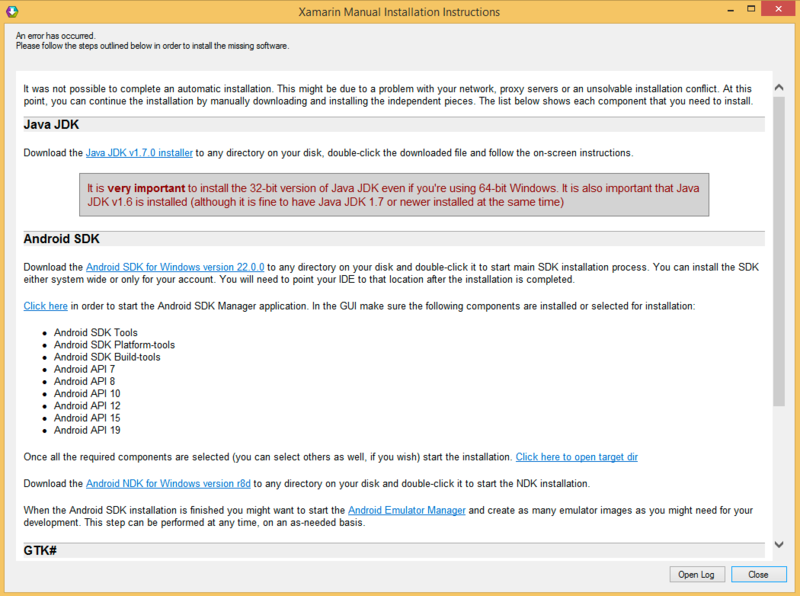 A new version of the universal installer has now been published. You will no longer need to set the clock back for this installer, but because it uses a new certificate, you might receive a SmartScreen warning when you run it. See: http://forums.xamarin.com/discussion/28309/windows-smartscreen-warning-more-info-run-anyway for more details. As reported in a few other places on the forums and Twitter, the Xamarin installers for Windows are temporarily broken. There are 2 causes. For the individual product installers, the problem is expired signing certificates. For the Universal Installer, the problem is an expired signing certificate and an error in installer "manifest" file that tells it what to download. Yes, these are problems that the Xamarin release engineering and QA teams should not have allowed, but they did happen. The incident will be reviewed to determine how the failure was allowed and what should be done differently in the future to prevent it from reoccurring. New installers with up-to-date certificates are in progress and will be pushed to the channels ASAP. Set back your computer's date to November 20, 2014 or earlier. Set your computer forward again to the current day after completing the installation. Update NuGet Package Manager to 2.8.3 or higher (if it isn't already). 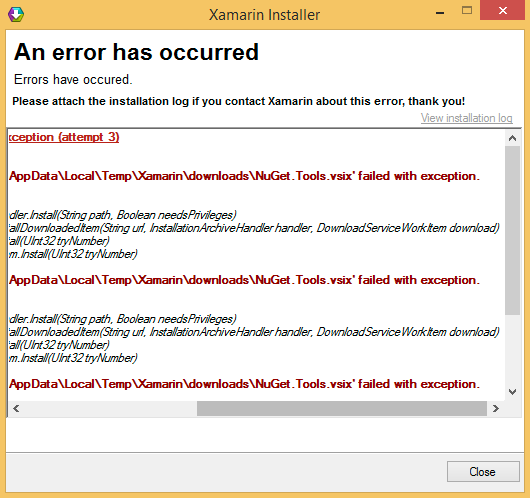 Could not install package 'Xamarin.Forms 1.0.6186'. You are trying to install this package into a project that targets 'portable-net45+win+wp80+Xamarin.iOS10+MonoAndroid10+MonoTouch10', but the package does not contain any assembly references or content files that are compatible with that framework. // Errors while installing items. // Installation of archive 'C:\Users\Windows User\AppData\Local\Temp\Xamarin\downloads\NuGet.Tools.vsix' failed with exception. Just a heads up, the universal installer was fixed, but the visual studio 2015 installer still doesn't work unless I set the clocks back to before the 20th. Also to get it to work, I had to go into "Programs and Features," right click on Xamarin and click change, set Visual Studio 2015 to be installed on the hard drive, click next and finish, and then I was able to see all of the new Xamarin templates in 2015. This is on Windows 10 Technical Preview x64.